Circular outline. Circular discus with uncertain figural relief, raised rim, and narrow, rounded framing ring. Rounded to sloping shoulder has large ovules. Ring handle with two lateral grooves attaches at back discus rim and midway down back wall. Circular, raised base. Fabric: 7.5YR 8/3, pink. Slip: 10R 6/6, red, to 10R 4/4, weak red. Hard, fine fabric has very rare, very small, rounded(?) black inclusions, larger calcitic particles, and very rare elongated voids visible at surface. Thick, semilustrous, even slip but mottled on all surfaces but continuing inside; distinct metallic sheen and smooth surface (brushed?). Knidian fabric. 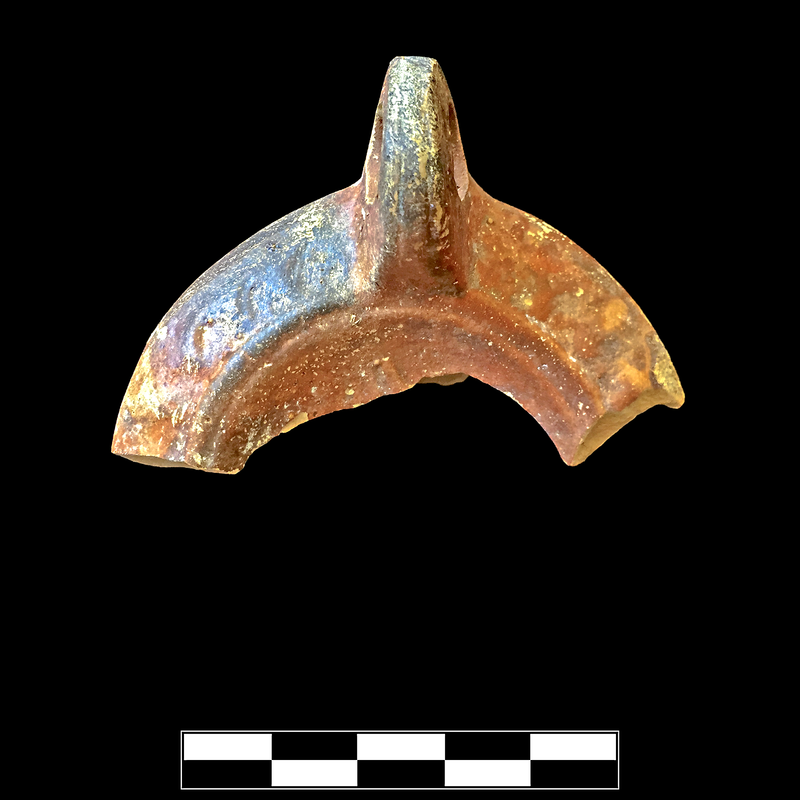 One large fragment preserves small part of discus, roughly one third of shoulder, entire handle, and back wall to base. Slight, sparse abrasion; sparse specks of encrustation.